My translation is the 1955 translation, published by Citadel Press in New York. I obtained my copy from The Compulsive Collector, Forest Hills, NY, USA via abebooks. 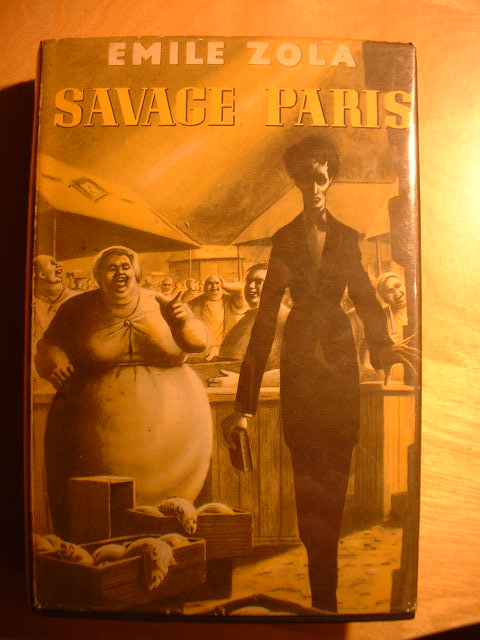 The novel is set almost exclusively in Les Halles, Paris among the fruit, vegetable, fish and meat markets. For some views of Les Halles today click here. There is one character who lives in Nanterre, and Florent describes his escape from Cayenne. Florent, who was deported in 1848, returns to Paris illegally 8 years later. The novel tells the story of how he is taken in by his brother and absorbed into the life of Les Halles as a fish inspector and then vomited out again as an agitator to be deported back to Cayenne. Much more than this it is a vivid picture of life in the new food markets of Paris. The descriptions of food and characters and streets take you to the place in a cinematic way that is breath-taking. As part of Zola's naturalism observations, it looks at and ridicules the falseness of the bourgeois shop keepers. I enjoyed the description in this book immensely. It brought scenes to life as vividly as any novel I can recall. The description of the black pudding making process is truly stomach churning! The street descriptions had me reaching for a Paris street plan on many occasions to map the descriptions to the modern day. The characters are more balanced than in La Curée and have both likeable and despicable traits. Characters such as Claude and Françoise are a welcome foil to the middle class 'fats' as Claude describes them. The story line was good although a little predictable but with such powerful descriptive writing I never felt disappointed.